Indeed, starting duck and fish combined farm is a profitable business. As a sequential linkage between two or more agro-related farming activities with one as a major component Integrate farming may be defined. That’s why duck and fish combined farm is also one of the agro-related farming activities. Also, as a sustainable farming system, the integrated of duck and fish farming with agriculture and animal husbandry is considered, which offers greater efficiency in resource utilization, reduce risk by diversifying crop, provide additional income and food for the small-scale farming household. Because the ducks are highly compatible with cultivated fishes, raising ducks over fish ponds fits very well with the fish polyculture system. While applied in the pond, direct as feed to fishes. Moreover, as live and natural feed to fishes, wastes in pond break down by microbes into an organic and inorganic fraction and into plankton. When pond water into crop field, pond silts fertilizer for agriculture crops, horticulture, and floriculture. By their co-existence, fish and ducks get benefits. While duck and fish combined farm is raising, the mutually beneficial effect comes out. And it essentially decreases the input cost up to 60% on fish culture operation. As the droppings of ducks act, it’s a substitute to fish feed and pond fertilizers. And ducks are making a safe environment for fish while consuming juvenile frogs, snails, dragonfly & tadpoles. Stimulating natural fish food organism, the excreta goes directly to the ponds contain essential nutrients Nitrogen & phosphorus. On the other hand, duck also acts as a bio aerator. And there is a big demand for fishes and ducks; you can start this business at the same time. Without any heaping of duck droppings, manure is conducted by ducks and homogeneously distributed. 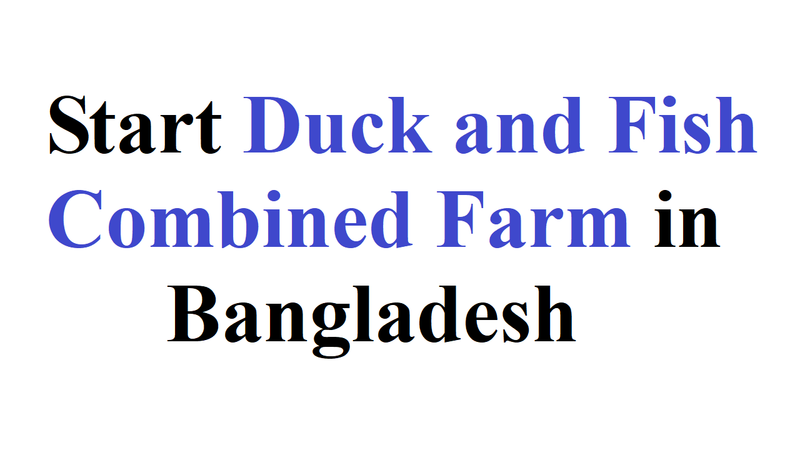 Well, let’s know what the steps are to start a duck and fish combined farm in Bangladesh. As a business plan is essential for other business, duck and fish combined farm also need one. A well-researched business plan not only says what your ways are to be set up the business but includes all the necessary steps that you need to be a success in the business. So, you must not underestimate creating a business plan. And if you’re unable to write a business plan then you have to hire someone who expert in this field. You must use original breeds which may cost BDT 5 to BDT10 for fishes. Also, buy the best breeds of ducks so that you can harvest a good amount of money. You can earn half the money through the sale and can spend on feeding ducks and the remaining amount was spent on the labor charges. Other than you may face loose if you select breeds wrongly. If you choose to launch a large fish farm with the capacity to supply fishes beyond your immediate community then it can be capital intensive. Especially, it may happen when starting a standard and well-equipped duck and fish combined farm. And you should build well-secured and conducive ponds, securing a large farmland. But, you may not have the need to go source for the fund to finance the business if you choose to start the business on a small scale. A farming business comes with its own challenges at its starting time. And for this business, location is one of the challenges. As the location you chose to construct your fish ponds is a key to the success of the business, it cannot be overemphasized. You would have to prove that you have the capacity to manage a fish farm as a fish farmer. That’s why it will pay you to first build your capacity if you have plans to start your own fish farming and duck farming business. Although the fact that the entry barrier for starting a small scale fish farming business is low, there is bound to be more players in the field.